I love the chill in the air and pulling out my woollens, but the end of the year is coming up so fast! Sometimes I feel like I don’t have enough time to breathe before the next project/to-do/event/etc comes up. Should be lovely and cozy. 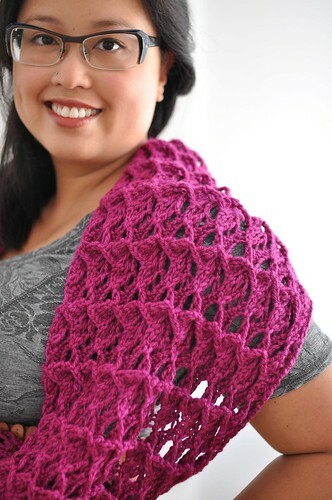 I think I’ve decided to start another sweater for NaKniSweMo, but I’d like to get this one done too! I’m also knitting lots and lots of socks. I’d love to get back to blogging more regularly, and I’ve got patterns for you too! Several sweaters (including my Rhinebeck ones) and some accessories too. Unfortunately I took a bit of a spill last night and ended up with a pretty big gash on my chin, so photoshoots might be a bit challenging! But a cowl can cover it up, right? I wouldn’t worry about the chin gash.I love the idea of snuggling up into a cowl though. i think the chin gash will look just dashing and lend character to the knit. so don’t worry. :) but i am glad you are OK and i hope not in any pain. in the mean time- if you don’t want to model you have a dress form, no? WOW, I love that color combination!! Is there a pattern for this? Hope your chin heals fast! Ouch! I hope you’re feeling better. Love your patterns and I’m eager to see more. Guess you’ll just have to start knitting some scarves! 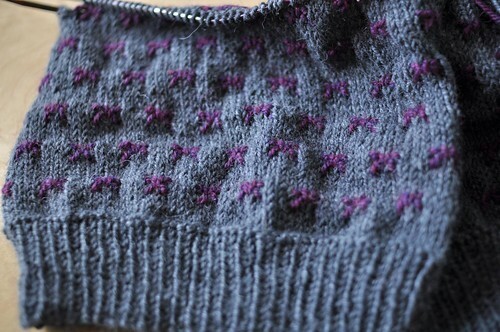 Your sweater looks beautiful so far, can’t wait to see how it turns out! I too hope you are okay… Looking forward to reading you more often and seeing your new knits! I loved seeing your Rhinebeck sweater at Rhinebeck. (sorry, lurker/stalker) Hope you heal up soon! A strategically placed cowl sounds like the solution to me!